Gattaca is the rare futuristic sci-fi movie that doesn’t over do it with flashy effects, locales, or flying cars. Instead, it’s a dramatic, thrilling ride that develops itself wonderfully through complex characters in a world that seems utterly plausible. 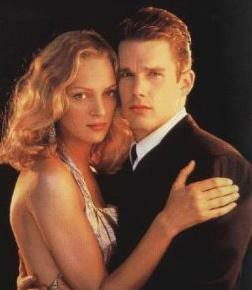 Gattaca is fantastic sci-fi. Ethan Hawke is a “God Baby,” a child born of a natural birth. In this near future, it’s not the norm. Instead, genetically altered babies with no imperfections are how people are created. Being a God Baby puts the child at a disadvantage, unable to attain jobs that now require perfection, such as an astronaut which Hawke strives to be. Since he’ll never be able to bypass the strict security of the space facility Gattaca, he takes on the DNA of Jude Law. It’s a complex process, one that carries many risks and painful procedures. Once inside, a murder complicates matters, and a team of investigators instantly suspects Hawke due to a small mistake. What’s most impressive about Gattaca is how the plot is laid out. There is very little explanation. All of the questions asked by the audience are explained in the story itself. The detective work during the murder investigation discusses everything, from how the DNA is part of daily life, class separation, profiling, and the gene switching. Long, drawn-out scenes of unnatural dialogue trying to clarify things that bog down many futuristic society films are absent. Even without action scenes, Gattaca is able to engage the viewer with its ideas. There are numerous ways to dissect the material, actually making for possible classroom study. It’s also refreshing for the film not to take another possible out, instead settling on a subtle, emotional finish that also bucks the trend. A mere review isn’t enough to delve deeper into the complexities of Gattaca, but it goes without saying that Gattaca was made for those looking for more from their sci-fi films. This is a film bound to hold onto its cult following. Welcome, one and all, to edge enhancement city, where today’s special is Gattaca! Thrill to the sights of Uma Thurman as she walks down hallways looking like a saint, thanks to garish bright outlines! Gasp in horror as men’s suits look radioactive as they glow for no apparent reason other than a horrible transfer! If you still feel like it, also visit DNR-ville! Watch as all facial detail is wiped from the frame of Gattaca, robbing the film of its unique style. Stare as black levels fail to generate any depth, and flesh tones enjoy squandering in orange. If that’s not enough, how about some color bleeding for that perfect final touch, effectively destroying any chance of this being worth your hard earned money? Given the dialogue-driven nature of the film, there’s not much for this TrueHD mix to process. The best sequence is one in which Hawke attempts to cross a street nearly blinded. Cars whiz by the speakers left to right with incredible accuracy. There is some minor ambiance, including a piano performance and dinner sequence. The disc also does a fine job with echoes, enveloping the viewer inside the rather empty rooms the film uses as backdrops. Extras are mostly brief. One (yes, one) outtake is included, followed by a trio of featurettes. Do Not Alter is a history lesson on genetics, followed by the excellent Welcome to Gattaca. The latter is a 22-minute making-of with plenty of interviews and insights. A promo featurette can be skipped. Six deleted scenes run 10 minutes, and are of low, VHS quality.